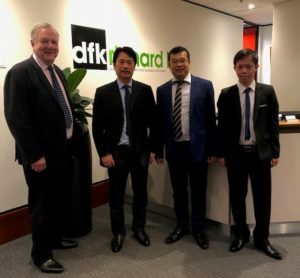 DFK Richard Hill welcomes Nguyen Dac Long from DFK Vietnam to its Sydney office. Long is visiting Sydney for 6 weeks as part of DFK staff exchange programme to expand his professional development and to experience a different workplace. He will be assisting our audit and business services teams and will be working under the supervision of Dominic Pham. This is a very exciting time for DFK Richard Hill as well. It is a great opportunity for the firm to strengthen its relationship with member firms overseas. We wish Long a successful stay at DFK Richard Hill and hope he takes home with him valuable experience, both professionally and personally.